The World Academy of Vedic Mathematics is beginning to have an impact on mathematicians and mathematics teaching and on the dissemination of Vedic Mathematics. As you can see at the top of this page this newsletter is now the newsletter of this Academy. To make contact with the Academy in India see listings later in this newsletter. This issue’s article is taken from the recently published brochure for the World Academy of Vedic Mathematics. IRRFIH is intended to carry out research in the fields of philosophical, scientific, spiritual and cultural heritage of India where Ancient Wisdom is brought to the modern age. Indian wisdom was accepted the world over by scholars and travellers frequenting India, making it a rendezvous for the east and the west. Indian education and scientific research needs to be revived, since India's scientific heritage has not only gained popularity, but respect, for its superb, deep knowledge. Today's concern, interest and ambition of positive Sciences and Mathematics relates to higher consciousness. Vedic Maths has nothing to do with religion. It's all about Mathematics, pure and simple. 1t is a revised form of the ancient Indian system of mathematical heritage. Fondly known as Cosmic Computer in several countries where Vedic Maths is part of the educational curriculum. How did it all begin? The re-discovery was made by the Bharati Krsna Tirthaji (1884-1960), who became the Shankacharya of Govardhan Math, Puri. He collected lost mathematical knowledge (Ganita Sutras), reconstructed them into 16 basic sutras or word formulae to solve every known mathematical problem. Originating from an oral tradition it is not surprising that Vedic mathematics features mental methods. This helps ones mind to become a bio­-calculator The ancient Indian culture encouraged higher levels of intelligence with minimum of effort, toil and worry. The best part of these ancient systems was that any subject that was taught utilized most part of the brain with no discrimination between using only the left or the right side of the brain. Vedic Maths removes the fear and monotony of the western methods of mathematics that banishes the interest from the mind almost forever. Today mathematics is needed in all fields of existence. Without interest in maths the entire education remains insufficient. The best possible way for interest to grow is to have a holistic and creative approach that can re-kindle the power of the brain. Why else would the west adopt Vedic Maths like a duck to a water? Why would NASA use this mental one-line system of arithmetic in the field of Artificial Intelligence? Software engineers in Banglore are pursuing the possibilities of using Vedic Maths in the aspects of cryptology and data transmission. Western experts have established beyond doubt that Vedic Maths is far simpler and more coherent as a learning system than the conventional system. Westerners have been astounded by the elegant, easy and integrated approach and have acknowledged and acclaimed the superiority of Vedic mathematics over modern calculators, which makes it modern and user friendly. We need to research and advance further to gain our lost science of clairvoyant calculations that ancient Indians were so used to. Today Vedic Maths has become part of the education curriculum in U.K, Ireland, Holland, South Africa, Australia, New Zealand and USA. Besides its positively picking up in Sweden, Germany, Italy, Poland and Singapore. lndian scriptures - the perennial source of knowledge and wisdom have many subjects hidden in them. The ancient seers saw mathematics in nature and have expressed profound mathematical concepts in the form of hymns and verses starting from the fundamental place values to advanced astronomical concepts. Ancient Maths was not just related to one specific historical time or area, but it's found in all schools of thought and faiths. It's said that the ruler of Baghdad invited a scholar from Ujjain, where he taught science and maths. They also translated Indian books into Arabic. This system then traveled to Europe in the 11th century. A scholar named Al-Biruni traveled to India to learn the Indian sciences. Living for thirty years he wrote a number of books, one of them was called 'Hisab-al-Hindi'. In the Jain books such as, 'Ganitasarasangraha of Mahaviracharya'- 850 A.D, talks about a quantity that grows until it reaches six, then it decreases in reverse order. The Indian mathematicians had a passion for numbers of huge value. The Jain scholars have mentioned numbers 10190, 10250 and 10421 in the book Lalitavistara. One lakh, which is 10^5, is also mentioned in the book before 308 A.D. Jinabhadra Gani of sixth century A.D in Brihatshetrasamasa, expresses place value system for 224,400,000,000. With development of maths and science, Astronomy had a far- reaching impact on research. Knowledge of the Universe and its behavior is well noted. Indians did not just stop at inventing zero and the decimal system, but went into depth and quantity as well. Numerals and writings went hand in hand in the ancient world. Numerals were not just needed for certain segments of work but were also used in poetry, grammar and philosophy. Playing with numerals was a fun game in those days. The concept of the basic and important numeral zero stems from philosophical thinking. Zero literally means void or empty- a mystical figure. Zero is like a kingmaker a person who has got no independent value of it's own but attains greatness in combination with ordinary persons. As when zero is suffixed to numerals l to 9. Such people have place-value. Zero is neither positive nor negative; it's neutral. In this way ordinary numerals have great gravity. The examples and quotations below are an ample testimony of wide-spread acceptance of Vedic Maths. As of 1st February 2004 Dr. S.K.Cosmic Kapoor is continuing with the second phase of his Vedic Mathematics Course-1. This phase focuses on “Space book on artifices of numbers”. Venue: 108 Herston st, Kelvin Grove, BRISBANE (near Royal Brisbane Hospital, up on hill). The World Academy for Vedic Mathematics, an integral part of the International Research & Resource Foundation for Indian Heritage is the central body working for the cause of Vedic Mathematics across the world. The academy recently arranged Introductory Workshops at Chinmaya Mission hall in Kolkata with the support of Motilal Banarsidass Publishers, a premier publishing house in the country. Around fifty-five candidates attended the workshop. The age of the participants ranged from ten years to fifty-four years. The workshop started from 10:30 a.m. in the morning and continued till 01:00 p.m. The workshop was conducted by Debmalya Banerjee. The response of the crowd was absolutely overwhelming. Lot of questions were asked as the workshop had interactive session too. The expert not only explained the Vedic Methods of Calculation but also gave a brief introduction of the subject too. The participants were eager to know the books, which are available on this subject and also the kind of courses. Even some people called up the expert to know the kind of courses that are available. The workshop was attended by people who had varied academic profile. Some of them were chartered accountants, students (school, college, and engineering schools), Mathematics teachers, F.C.A`s, engineers, B-school graduates, M.B.A aspirants. Even a Judge of the Kolkata High Court came to attend the workshop amidst tight security measure. At the end the importance of Vedic Mathematics was summed up by the participants. The event was covered by the Times News Network under the heading “Numbers, the swift way”. The event also got coverage from timesofindia.com the Internet version of the newspaper, too. An International Bengali Channel too broadcasted the interview of the expert too, in its news bulletin. The organizers had a tough time to handle the enquiries, which took place prior to the workshop by the enthusiasts of the town. World Academy is planning to organize more workshops in future, as there is a growing demand for the same. A workshop had been arranged by the Tej Gyan Foundation , Pune, on 27th and 28th of December 2003, under the auspices of ‘The World Academy for Vedic Maths’ . On 27th evening there was an introductory lecture for about 1hr 30mins . It was attended by about 40 participants of all age groups. 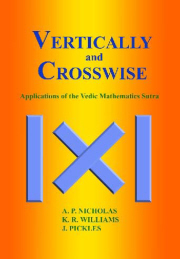 A comprehensive idea about Vedic Maths supported by a few examples in Nikhilam Multiplication and other types of mental additions, subtractions, etc., were explained. Emphasis was made on encouraging children to do mental calculations wherever possible. The sutras like Nikhilam, Sankalana Vyavakalanabhyam, etc., were very enthusiastically received. On 28th, there was a full day workshop from 10a.m. to 6 p.m. There were about 200 participants. Many school children of secondary, higher secondary,and junior college level attended. There were also other participants like school teachers, college teachers and others. Right from the beginning it was a very interactive session. The children especially took a very active part by shouting out the answers fast. They were encouraged to workout most of the problems in the mind and avoid paper work as far as possible. Many were interested in knowing more. A few teachers were familiar with Vedic Maths and wanted to know about further developments, especially in calculus. Many wanted to know about the books available on the subject. The books published by Motilal Banarsidass were on display and they were enthusiastically picked up. They evinced interest in having more such workhops in future. On 29th there was an introductory workshop for the teachers of the ‘Sanjivani Trust School’ at Panchgani. Panchgani is a hill station about 2hrs. drive from Pune. The School Principal and a few trust members also attended. The primary teachers liked mental additions and subtractions very much since they felt the children would love the methods. A few examples from various sutras like, ‘Sankalana Vyavakalanabhyam, Nikhilam, Yavadunam Tavadunikritya, Lopana sthapanabhyam, etc., were shown. After the workshop the teachers returned to ask many questions as to how these could be incorporated in the school teaching. They were very thrilled with the concepts of Vedic Maths. The Principal brought his two daughters (studying in stds. 8 and 6) and wanted them to be shown some examples in straight squarings and Nikhilam multiplications. He was very impressed and said that he was very much interested in training his teachers in VM method. They also showed interest in more workshops in future. On the whole it was a very satisfying experience. This was part of the Dutch National Mathematics Days 6th, 7th February 2004. The talk was given by Kenneth Williams and was attended by about 50 people, the room was full. The group were fascinated by the Vedic methods and their coherence and elegance. Many personally expressed their gratitude and enjoyment after the event. Because some at the Conference who wished to attend the Saturday talk were unable to do so, a brief informal talk was arranged on the Friday evening. This was also very well received with the original group of 8 people swelling to about 30 by the end as passers by joined it. Myself Ashutosh Dhiman, I am doing ME in Computer Science at Punjab Engineering College, Chandigarh. Currently I am designing and developing a Vedic Mathematics Simulator for the Study of Vedic Algorithms. This simulator would provide an interactive learning environment to the students, which help them to learn Vedic Mathematics easily. I have already implemented ten Sutras in VB 6. I hope I will complete this simulator by the end of December 2003. An excellent article by Rajeshree Sisodia, “A Breath of Fresh Air from India”, has appeared in the Times Educational Supplement (UK publication), January 9th 2004. Another article, by Marco Swaen, has appeared in the Dutch journal ‘Pythagoras’, Dec 2003 edition. It is called "Rekenen met sutra’s – Aflevering Productsommen"